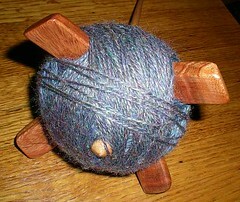 Ask The Bellwether: How can I get more yarn on my spindle? How can I get more yarn on my spindle? To maximize the yarn you can get onto your spindle, I recommend trying an X wind-on (ispindle.com has a writeup on this) -- they let me get more onto my top whorl spindles. Also, if the spindle's misbehaving, letting the yarn slip through the hook, I'll wind down to the bottom of the cop on the spindle, twist tightly around the shaft once or twice, and then come up to the top again (on a top whorl spindle, that is), to keep putting more fiber on the spindle. All that said, a Turkish spindle probably takes the most yarn -- I can just keep winding larger and larger balls on my turkish spindle without it complaining. 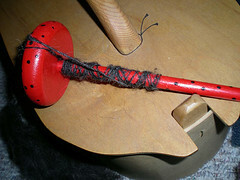 I barber pole up the shaft, half-hitch at the top, and spin again. How do you spin on a notchless spindle? How do you wind on a Turkish spindle? What is your favorite spindle weight? Questions? Comments? Post them on the blog or contact me. Thanks!